So what’s happening here? The orange glow at the bottom of this frame is light from 1,800° F lava bubbling in Halemaʻumaʻu Crater inside Hawaii’s Kilauea Caldera, reflecting off a low-hanging bank of clouds. The white band above the crater is light cast by billions of stars at the center our Milky Way galaxy. So dense and distant are the stars here, their individual points are lost to the surrounding glow. Partially obscuring the Milky Way’s glow are large swaths of interstellar dust, the leftovers of stellar explosions and the stuff of future stars. Completing the scene are stars in our own neighborhood of the Milky Way, stars close enough that we see them as discrete points of light that we imagine into mythical shapes—the constellations. The Milky Way galaxy is home to every single star we see when we look up at night, and 300 billion more we can’t see—that’s nearly 50 stars for every man, woman, and child on Earth. Our Sun, the central cog in the solar system that includes Earth and the other planets wandering our night sky, is a minor player in a spiral arm near the outskirts of the Milky Way. But before you get too impressed with the size of the Milky Way, consider that it’s just one of 500 billion or so galaxies in the known Universe—that’s right, there are more galaxies in the Universe than stars in our galaxy. Everything we see is the product of light—light created by the object itself (like the stars), or created elsewhere and reflected (like the planets). Light travels incredibly fast, fast enough that it can span even the two most distant points on Earth faster than humans can perceive, fast enough that we consider it instantaneous. But distances in space are so great that we don’t measure them in terrestrial units of distance like miles or kilometers. Instead, we measure interstellar distance by the time it takes for a beam of light to travel between two objects—one light-year is the distance light travels in one year. The ramifications of cosmic distance are mind-bending. Imagine an Earth-like planet revolving the star closest to our solar system, about four light-years away. If we had a telescope with enough resolving power to see all the way down to the planet’s surface, we’d be watching that planet’s activity from four years ago. Likewise, if someone on that planet today (in 2014) were watching us, they’d see Lindsey Vonn claiming the gold in the Women’s Downhill at the Vancouver Winter Olympics, and maybe learn about the unfolding WikiLeaks scandal. In this image, the caldera’s proximity makes it about as “right now” as anything in our Universe can be—the caldera and I are sharing the same instant in time. On the other hand, the light from the stars above the caldera is tens, hundreds, or thousands of years old—it’s new to me, but to the stars it’s old history. Not only that, every point of starlight here is a version of that star created in a different instant in time. It’s possible for the actual distance separating two stars to be so great, that we see light from the younger star that’s older than the light from the older star. So what’s the point of all this mind bending? Perspective. It’s easy (essential?) for humans to overlook our place in this larger Universe as we negotiate the family, friends, work, play, eat, and sleep that defines our very own personal universes. I doubt we could cope otherwise. But when I start taking my life too seriously, it helps to appreciate my place in the larger Universe. Nothing does that better for me than quality time with the night sky. 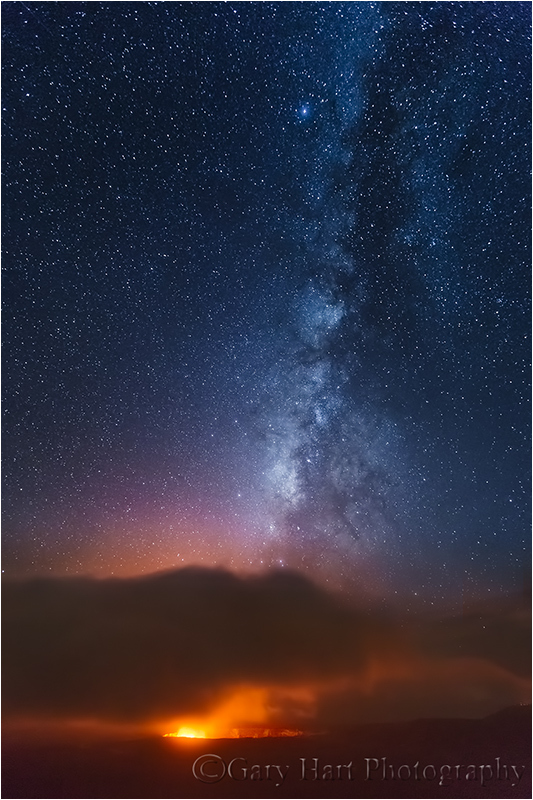 My 2014 Hawaii Big Island photo workshop group made three trips to photograph the Kilauea Caldera beneath the Milky Way. On the first night we got a lot of clouds, with a handful of stars above, and just a little bit of Milky Way. Nice, but not the full Milky Way everyone hoped for. So I brought everyone back a couple nights later—this time we got about ten minutes of quality Milky Way photography before the clouds closed in. The following night we gave the caldera one more shot and were completely shut out by clouds. Such is the nature of night photography in general, and on Hawaii in particular. This image is from our second visit. My concern that night was making sure everyone was successful, ASAP. I started with a test exposure to determine the exposure settings that would work best for that night (not only does each night’s ambient light vary with the volcanic haze, cloud cover, and airborne moisture, the caldera’s brightness varies daily too). Once I got the exposure down and called it out to the group, most of my time was spent helping people find and check their focus, and refine their compositions (“More sky! More sky!”). Bouncing around in the dark, I’d occasionally stop at my camera long enough to fire a frame, never staying long enough to see the image pop up on the LCD. I ended up with a half dozen or so frames, including this one from early in the shoot. I love your new “gallery” posts!!! Thanks, Lynda. I’m only sorry I did’t start doing it sooner.